There are many different Wonders of the World lists in existence, but this article will focus on the Seven Wonders of the World set out by Herodotus, the historian from Ancient Greece. This list is sometimes known as the Seven Wonders of the Ancient World and only includes wonders from around the Mediterranean. 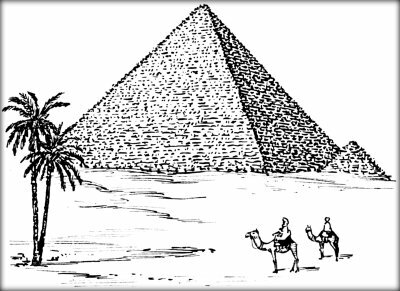 The Great Pyramid is the oldest of the the Seven Wonders of the World. It was constructed in Giza, Egypt in about 2560 BC. Despite its age, it is the only one of the Seven Wonders to remain intact. Historians believe that it was built as a tomb for Ancient Egyptian Pharaoh Khufu. The pyramid is about 140 metres high. 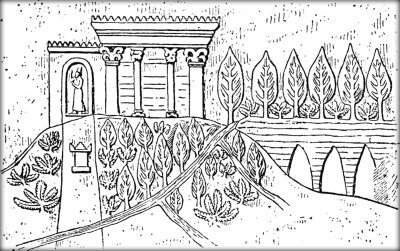 The Hanging Gardens were supposedly built by Nebuchadnezzar II, the King of Babylon (a city-state in modern-day Iraq). However, many historians believe that the Hanging Gardens were only a legend and never really existed. The archaeological evidence is inconclusive and they are not mentioned in any ancient texts from the Babylon region (although they are talked about by both Greek and Roman writers). It is estimated that it would take 35000 litres of water in order to irrigate the Hanging Gardens of Babylon. 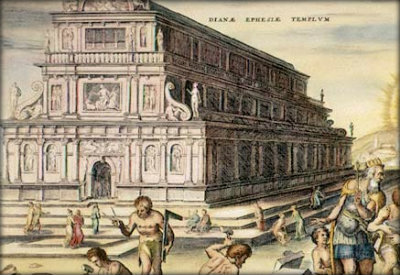 Located in Ephesus (in modern-day Turkey) the Temple of Artemis was built by the Ancient Greeks and was dedicated to the Artemis, the Ancient Greek god. 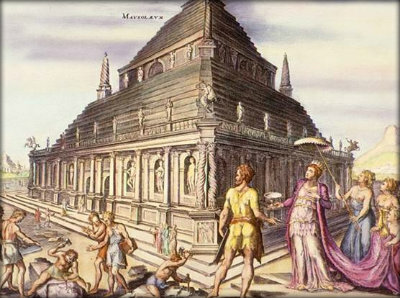 The temple was damaged and rebuilt three times before it was finally destroyed, possibly in 268 AD by the Goths (a Germanic tribe). The site of the temple was re-discovered by John Turtle Wood, a British archaeologist, in 1869. The Statue of Zeus was created by the Ancient Greek sculptor, Phidias in the 420s BC. 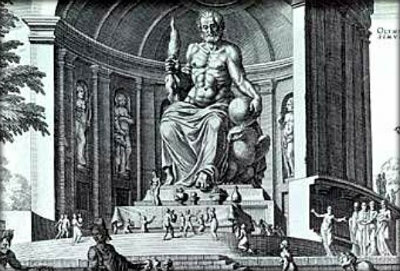 The statue was 13 metres high and it depicted Zeus, the leader of the Greek gods, sitting on his throne. It was located at the Temple of Zeus in Olympia, Greece. The statue was destroyed in the fifth century. The Mausoleum was a tomb built for Mausolus, a governor (or satrap) in the Persian Empire and his wife, Artemisia II of Caria. It was constructed between 353 BC and 350 BC and was designed by Greek architects and features reliefs by Greek sculptors. We get the word mausoleum (or tomb above ground) from this Wonder of the World. It was destroyed at some point during the 12th century and 14th century. 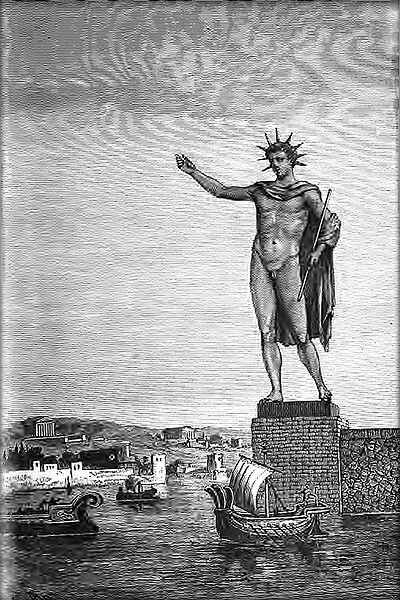 Constructed to mark the victory of Rhodes over Cyprus in 305 BC, the Colossus of Rhodes is a massive statue of the Greek Titan called Helios. The Colossus was more than 30 metres high. Many people believe that the Colossus straddled the harbour of Rhodes. In fact, this is probably a misconception. Most historians now agree that both of the Helios’ feet rested on the same pedestal. The Colossus was destroyed in an earthquake in 226 BC. 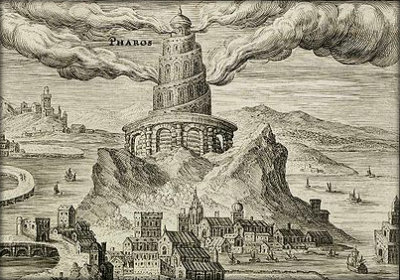 The Lighthouse of Alexandria was located on the island of Pharos in Alexandria, Egypt. It was constructed between 280 BC to 247 BC. Historians believe that the height of the lighthouse was greater than 120 metres and when it was built, it was the highest man-made structure in the world. The lighthouse was abandoned in the 14th century after it became ruined following an earthquake. In the very earliest Seven Wonders of the World lists, the Ishtar Gate (the eighth entrance to the inner city of Babylon) replaced the Lighthouse of Alexandria.